Try this light yet tasty recipe for a homemade Valentine’s Day dinner. It requires just 6 ingredients and can be ready minutes. Preheat the oven to 350 degrees F. Place the rosemary in a single row in a small baking pan, such as an 8-inch square pan. Top with the fish. Brush the fish with the oil. Sprinkle with the lemon juice, salt, and pepper. 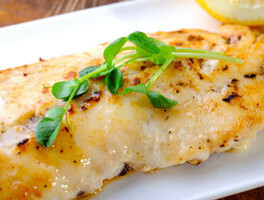 Bake for 7 to 8 minutes or until the fish flakes easily when tested with a fork.